I think I need to start a new post category called “Things I thought I hated”. First up: tomato sauce. I have never really liked tomato sauce. On pizza, sure. On pasta? Not so much. Maybe I’ve just never had the chance to try really good tomato sauce. The thing is, tomato sauce usually has lots of things added – sugar, spices, herbs, cheese. Especially here in West Virginia, it seems like everyone’s grandma has a great recipe for herby/spicy/meaty sauce. And to that, I say “eh”. This is as close as a person can get to bare naked tomato sauce, short of just cooking down a pot of tomatoes. It only calls for three ingredients: fresh tomatoes, butter, and an onion. Maybe four ingredients, if you count a dash of salt. It’s unbelievably easy, too. I cooked up a batch this afternoon and it didn’t even feel like work. The butter does amazing things for the texture and flavor of this sauce, cutting through the acid and making it velvety and sweet so you won’t miss the sugar, even a tiny bit. The best part of this sauce (aside from the butter) is that it is light. It’s missing that heavy, cooked flavor that lots of store-bought tomato sauces have. Does this sound too simple to be delicious? It’s not. Trust me on this one – I just ate a bite straight from the jar. That’s a first for me, folks. Toss the tomatoes, water, and onion into a medium sized pot and simmer over medium heat until the tomatoes begin to soften. Add the butter and cook until the sauce thickens up to your liking, 45 minutes-1 hour more. Smash the tomatoes against the side of the pot as they cook, to get a nice barely-chunky sauce. Pull out the onion pieces and salt to taste. Eat it immediately over pasta, or store in the fridge or freezer. Ta da! Told you it was easy. *San Marzano tomatoes are a good choice for sauce making, but I used four big heirloom tomatoes and it was still delicious. Also, if you want to cheat or don’t have access to fresh, use a 28 ounce can of stewed whole tomatoes. 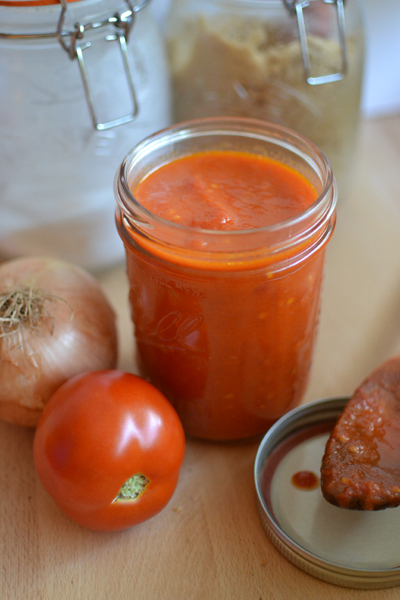 Tags: budget, gluten free, Italian, pasta sauce, recipe, simple, summer, tomato, vegetarian. Bookmark the permalink. I just wrote about how I thought I hated chili… what is it with tomatoes and wrong conclusions? Great idea! Who knows? I think canned tomatoes might be giving tomatoes a bad reputation. Your chili and cornbread recipes look delicious!